had as much brains as men and could do things as well if she gave them her undivided attention." 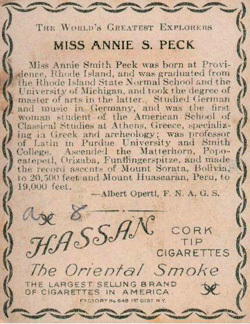 Without a doubt, Annie Smith Peck is among the most distinguished alumnae of Rhode Island College; indeed she is one of the most notable women in the history of Rhode Island -- it's a tragedy that so few people know of her life and accomplishments. She was a born in Providence on October 19, 1850, the youngest of five children of George B. Peck and Ann Power Smith Peck. Her father was a graduate of Brown and a member of the Providence City Council; he had a successful law practice as well as operating a wood and coal yard. Annie attended Dr. Stockbridge's School for Young Ladies in Providence, continuing on to Providence High School, and afterwards enrolling at the Rhode Island Normal School, from which she graduated in 1872. After teaching high school in Providence, she moved to Saginaw, Michigan where she became the preceptress of their high school. This was about as far as most women of her generation could go in terms of educational attainment, but Annie dearly wished to continue her studies. She enrolled at the University of Michigan --which had only opened its doors to women for the first time in 1870 -- and completed a four-year course of study in three years, graduating with honors in 1878 with a major in Greek and classical languages. She immediately continued on to earn a master's degree in Greek, which she completed in 1881. With her A.M. in hand, she accepted a position as a professor of Latin and elocution at Purdue University, one of the first women in the United States to attain such a rank. After a two-year sojourn in Europe, during which she was the first woman student at the American School of Classical Studies in Greece, she returned to the U.S. and accepted a teaching position at Smith College. By 1892, she was well-known enough to support herself through public lectures, and resigned her position at Smith. For someone of lesser gifts, these accomplishments alone might seem to be a lifetime's achievement. But Peck was restless, and at the age of forty-four took up the (then unheard-of for a woman) pursuit of mountain climbing. 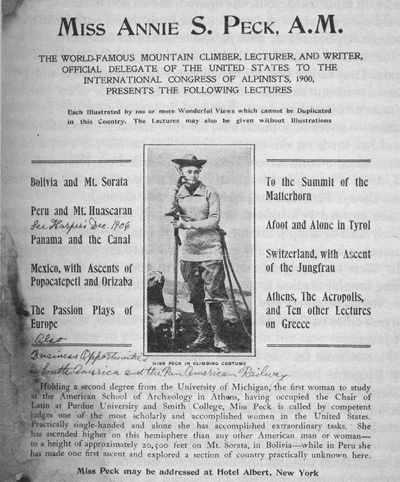 After several attempts, she became only the third woman ever to scale the Matterhorn in the Swiss alps, and the first to make the climb in trousers rather than a cumbersome skirt. 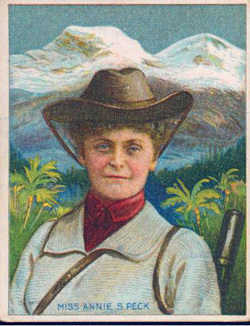 She continued climbing peaks throughout the world, achieving her greatest triumph with her record-breaking ascent of the north peak of Peru's 22,205-foot Mount Huascaran in 1908 at the age of fifty-eight! It had taken her nearly a decade, and no fewer than six attempts, to reach this goal. At the time, the exact height of Huascaran and others of the world's highest peaks was not fixed, and she believed she had climbed the highest summit in the Americas -- but nevertheless, she was the first person ever to scale its heights, man or woman. In addition to the rigors of the climb she had to cope with the ridicule of many male mountaineers, limited funding, and equipment which, since it was designed for men, was often ungainly and ill-fitting. For her ascent of Huascaran, she designed her own mountain shoes and had them made to her order. 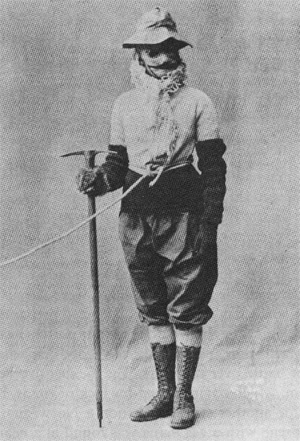 Annie S. Peck's outfit for her final attempt on Huascaran -- complete with a "rather superfluous painted moustache"
A strong supporter of women's suffrage, she next climbed Peru's Mount Coropuna (21,083 feet) in 1909 and planted a "votes for women" pennant on its summit. She continued traveling and mountain-climbing around the world almost until the end of her life; her last ascent was of New Hampshire's Mount Madison -- a mere 5,636 feet -- at the age of eighty two! A poster announcing one of Peck's lectures -- from Women of the Four Winds -- Click to enlarge. Watch this page for more information about Annie Smith Peck. and are not official documents of Rhode Island College.